Marmalade: See it being made! 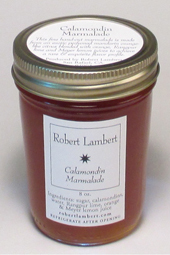 An exclamation point follows this special choice for the marmalade lover in your life! Choose any THREE items from this list below. Indicate your choices in the NOTES section on the cart page. They will be shipped in this beautiful tri-window box with lush trimmings (pictured). Indicate your choices in the NOTES section on the cart page. 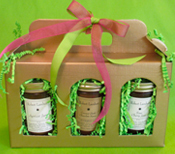 They will be shipped in a beautiful gazebo box with lush green tissue and grosgrain ribbon (pictured). Though this uncommon varietal originates in the Philippines (where it's also known as calamansi), it it grown privately in Northern California and I am fortunate to have access to this remarkable citrus known to make the very best marmalade. Tiny, delicate, and full of seeds, I used manicure scissors to harvest them, then took several days to cut them. The result was well worth the effort–deep, brilliant, jewel-like color, fine strips of delicate peel and a bright, piquant flavor that dances between mandarin, orange and lime, with a long finish all its own. It rarely gets any better than this! Get yours now, the limited supply never lasts for very long! 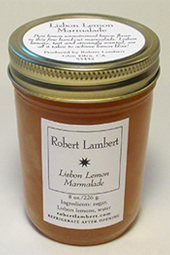 Pure unrestrained lemon flavor in this fine hand cut marmalade. 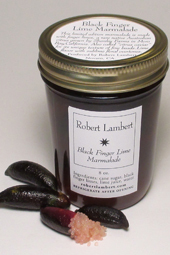 I tried for years to make a Meyer lemon marmalade but never succeeded to my satisfaction. Not tart enough, thin skins that turned milky when cooked—they just didn’t work for me. My Rangpur lime grower in Carmel had some Lisbon lemon trees, and I began experimenting with them, first as a member of my syrup line. These are the work horses of the lemon world, all available lemons are either these or Eureka’s, but when they are allowed to ripen and grow to full size—what a difference! Thick heavily scented skin and sharp tart juice make for a perfect marmalade, and leaves me wondering what took me so long to come to that conclusion. No blends here to cloud the primacy of lemon, personified! 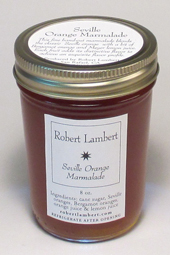 My version of this classic sour orange marmalade blends in a small amount of bergamot orange for its perfume, and Meyer lemon, which has some orange parentage, for complexity. An English friend has dreams of this. The berry-like tang of deeply colored blood oranges from the DeSantis family is here blended with their Seville oranges and some fine pear vinegar to balance the sweetness of this fruit. 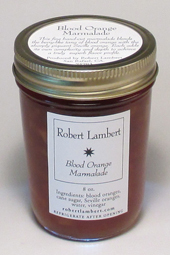 For those who lean towards a sweeter marmalade, as well as those who love blood oranges. For the first time I have contacts for enough Rangpur limes to add a single fruit marmalade to my line. The qualities of this fruit that you may have enjoyed in the Rangpur Lime Syrup, Salt-Preserved Rangpur Limes, or the flavor boosts in several of my marmalade blends, embrace their essence here. With thin skin and brilliant color, this bright, smoky sour mandarin orange makes a perfect marmalade. Enjoy on toast, cheese, in marinades, or, as Erik Adkins at The Slanted Door in San Francisco does, in cocktails! I pick white cocktail grapefruit, my favorite, from an old tree near downtown Napa, California and blend them with several Gene Lester rarities. The Mandalo and Poorman oranges are both delicious orange-grapefruit hybrids, and the 2 others, Shekwasha and Sacaton citrumelo, are grapefruit-like exotics with notes of passionfruit, mango, pineapple and pine. An even greater proportion of juice here and a blending of the exotic and familiar make this stellar marmalade a rocket-ride of superb flavor, with a long finish, gorgeous color and a perfect set. Wonderful with cheese. These oddities are natives of Australia that rode the continent as it broke away from Asia. In a more harsh and dry environment they evolved into shrubs with tiny leaves, fierce thorns, and strange, delectable fruit. They are about an inch long with thin peel that runs from a rusty red to green, and are filled with tiny green to pink beads, also known as ‘citrus caviar,’ that burst to the bite, releasing a unique, heady floral lime flavor I can only call addictive. Rarely grown here, I have access in Moro Bay California. 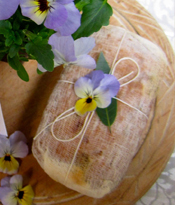 A delight to chefs and connoisseurs everywhere. 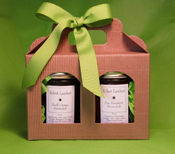 At the end of this season I have managed to secure enough fruit for a single batch of marmalade as a special offer to my online customers. Enjoy this miracle of nature while it lasts!